A New Jersey family is suing Six Flags Great Adventure more than two years after their daughter endured a terrifying ride aboard the amusement park's El Diablo ride. Rachel Alesiani rode the vertical thrill ride, a 7-story tall "loop" roller coaster, on Sept. 13, 2015 during a visit to the park in Jackson, according to NJ.com. Serafin and Margaret Alesiani said the restraint on their daughter's seat, consisting of a lap-belt and an over-the-shoulder harness, became disengaged soon after the ride began. El Diablo swings back and forth like a pendulum, building momentum to complete six revolutions. At one point, the ride stops at the peak of the steel track and temporarily suspends riders upside-down. The Alesieanis allege that Rachel was left struggling to hold onto the shoulder bar in order to remain in her seat throughout the ride. They further claim that Six Flags staff failed to check whether the restraint were secured prior to the start of the ride. 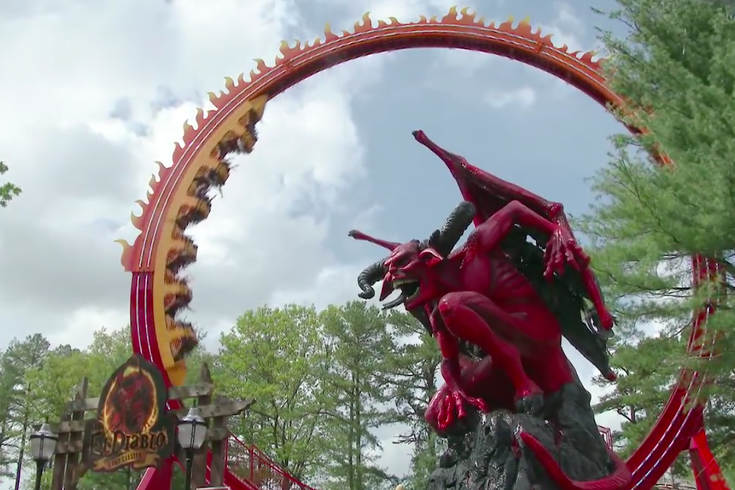 When Rachel got off El Diablo and informed her mother about what happened, the family alleges the ride was shut down for "technical difficulties." Among the "serious, severe and permanent" injuries the suit claims Rachel suffered, the Alesianis listed shoulder, cervical, thoracic and lumbar strains and sprains. They also contend she suffered "severe shock to her emotional, psychological and nervous systems." The lawsuit, transferred from state Superior Court to federal court, charges that Six Flags was reckless, careless and negligent for failing to ensure El Diablo's safety systems were working properly. The Alesianis are seeking monetary damages in excess of $75,000. Six Flags last week filed a motion to dismiss the case on grounds that it did not design, manufacture or sell the ride and that the Alesiani's filed the personal injury claim well after the 90-day window for New Jersey amusement park patrons to report an alleged incident.